Few in the aviation industry would name Xiamen Airlines in the list of leading Asia Pacific airlines, let alone in the Top 10. But Xiamen Airlines, now ranked sixth in Asia by seats per week, is a name to watch. The chiefly domestic Chinese airline is also one of the world's most consistently profitable, notching 24 consecutive years in the black - an amazing achievement given the volatility in the industry over this period. Further healthy growth by Xiamen Airlines is expected amid strong domestic and regional expansion. The carrier plans to significantly increase its scale over the next five years, targeting CNY30 billion (USD4.5 billion) in annual revenue, more than 30 million passengers and over 300,000 tonnes of cargo by 2015, the end of the 12th five-year plan (2011 to 2015). This will involve an average capacity growth rate of 14.9% p/a over the next five years. The carrier will also benefit from the development of a new airport in Xiamen as it grows its presence. 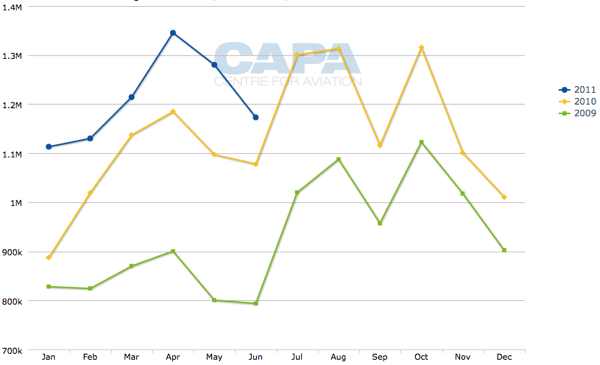 Xiamen Airlines is now the world’s 14th largest carrier by domestic capacity (seats) according to Innovata data for the week ended 16-Oct-2011, and the fourth largest Chinese airline in terms of domestic seats, behind only China Southern, China Eastern and Air China and ahead of Hainan Airlines. As noted above, it is also the sixth largest carrier in the Asia Pacific region in terms of systemwide seats. 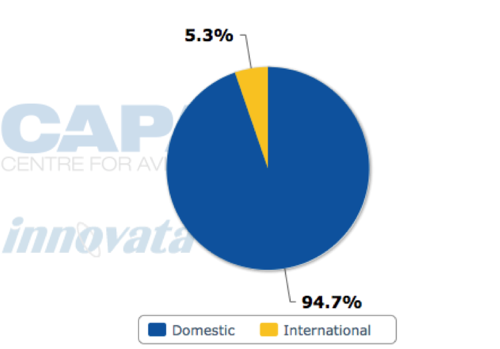 The carrier has a 6.9% capacity share (seats) of total system China traffic and a 8.2% domestic capacity (seats) share, according to Innovata. Xiamen Airlines transported 7.3 million passengers and 80,000 tonnes of cargo in 1H2011. It says it has enjoyed a 34.5% year-on-year increase in premium passenger numbers in the first eight months of the year. For 2H2011, Xiamen Airlines General Manager Che Shanglun expects the airline to transport 8.4 million passengers and 93,200 tonnes of cargo with an average on-time performance rate of at least 80%. Xiamen Airlines handled 13.6 million passengers in 2010, a 22% year-on-year increase and a 229% increase from 2001 levels. The carrier handled 148,100 tonnes of cargo in the 12-month period, a 25% year-on-year gain and up 151% from the 63,000 tonnes handled in 2001. Xiamen Airlines reported record operating revenue of CNY6616 million (USD1018 million) in 1H2011. This follows a record revenue and profit result in the full year of 2010, marking the carrier’s 24th consecutive year of profitability. Operating revenue reached a record CNY10,681 million (USD1618 million) in 2010, a 37% year-on-year increase and an impressive 212% increase from 2001 levels. The carrier also generated record profits of CNY1551 million (USD234.8 million) during the year, a 493% year-on-year increase and an almost 13-fold increase from 2001 levels. Xiamen Airlines held CNY13.0 billion in assets at the end of 2010 and Mr Che added the carrier’s debt ratio has been reduced to below 70%, thanks to the strong 2010 results and recent capital base enlargement. It is well positioned financially for its ambitious growth agenda. Based in Xiamen, a prosperous coastal city of East China's Fujian province (located strategically on the Taiwan Strait), Xiamen Airlines operates most of its services from Xiamen, and its secondary hubs of Fuzhou, Quanzhou and Wuyishan. The carrier’s network, which covers 119 domestic and 20 international routes (covering 10 international destinations) with around 3200 weekly seats, is heavily focused on domestic operations, with 95% of domestic seats deployed within the domestic market. The airline operates around 3200 weekly services. Looking forward, the carrier expects Fuzhou and Xiamen to remain its focus cities. "We are determined to develop Fuzhou and Xiamen into leading transportation hubs in Southeast Asia," deputy general manager Zhao Dong said. Major shareholders in the airline include China Southern Airlines and Xiamen Construction and Development Group. Xiamen Airlines is seeking to alter this domestic-focused profile, with vice president Zhao Dong last month stating the carrier plans to connect its Xiamen base and Fuzhou with all the provincial and administrative region capital cities with connecting services to cities in every Southeast Asian and Northeast Asian country over the next five years. Xiamen Airlines also plans to launch 'transoceanic' services by 2014 and European services by 2015, when it expands its fleet to more than 130 aircraft. At present, the operation of international flights contributes only 10% of the company's revenue and is limited to Kuala Lumpur, Singapore and Seoul. Boosting its international presence will meet increasing demand from regional economic development, Mr Zhao said. "We will add more flights from Xiamen and Fuzhou airports to provide tailored services for international passengers due to the establishment of the West Coast Economic Zone," he said. The economic zone, including the coastal cities of Xiamen, Zhangzhou, Quanzhou and Fuzhou along Fujian province, is expected to help accelerate the integration of its economy, transportation system and infrastructure with Taiwan, the carrier has said. In May-2011, Xiamen Airlines entered into an agreement with Boeing to purchase six B787 aircraft. The aircraft will be delivered in stages from 2014 to 2015 and will be used to launch services to Europe and the US from its Xiamen base and Fuzhou. The aircraft will increase the ATKs of the group by 3.5% from levels at 31-Dec-2010 and will be funded partly by internal resources and partly by financing arrangements with commercial banking institutions. Xiamen Airlines stated the order is consistent with its development strategy and will "enhance the competitiveness and core competence of the Group". Xiamen Airlines operates an all-narrowbody fleet of 78 aircraft at present, comprised of seven B757-200s, 18 B737-700s and 53 B737-800s. The carrier will expand its fleet size to 80 aircraft by year-end. It also has 30 B737-800s remaining on firm order. The carrier plans to double capacity in the 12th Five-Year Plan with its fleet to grow to 136 aircraft, suggesting another aircraft order will be required. To support its international aspirations, Xiamen Airlines is joining SkyTeam, joining China Southern and China Eastern in the grouping. Mr Zhao last month speaking to China Daily stated the China Southern subsidiary, is joining SkyTeam Alliance as "part of our efforts to further advance international ambitions". "Membership will help us transform from a regional airline into a global player," he added. The airline's application was approved at a SkyTeam council meeting in Jun-2011. "If the procedures are well advanced, we will become an official member of SkyTeam later this year," Mr Zhao said. Joining SkyTeam will help generate expected annual revenue for Xiamen Airlines of CNY30 billion (USD4 billion) over the next five years for the carrier, Mr Zhao said. However, he said that joining the alliance "will mean we may suffer some losses due to global economic fluctuations. But we have measures planned to avoid such a loss," Mr Zhao said, without providing details. SkyTeam is the largest airline in China, now with a 39% capacity (seats) share following the accession of China Southern and China Eastern/Shanghai Airlines. "We will launch more cooperation and share more flights with other airlines after becoming a member of SkyTeam," Mr Zhao said. Xiamen Airlines will sign an Adherence Agreement with SkyTeam in Nov-2011 as part of its progressive entry as a member of the global alliance, according to a Sina report. Xiamen Airlines is expected to formally join the alliance in late 2012 to mid 2013.